1. Boosts Energy: Tennis is an anaerobic sport that involves short bursts of intense energy, similar to a weightlifters experience. Start off a high-energy tennis match by obtaining excellent foot release from a Synthetic Grass tennis court. Sport Court Synthetic Grass courts, which can be installed in both residential and commercial applications, provide a surface for various player preferences with a range of speeds. 2. Lose Weight: Engaging in tennis drills burns calories, 300 to 700 calories a match depending on an individual's weight. Sport Court PowerGame surface allows you to lose weight with continuous play without any increased stress on your joints.The PowerGame surface extends time on the court for your journey of living a healthy lifestyle. 3. Cardiovascular: Playing tennis reduces your risk of heart disease and diabetes. Thriving for Novak Djokovic or Serena Williams style of play, obtain the same high performance level on a Sport Court tennis court. 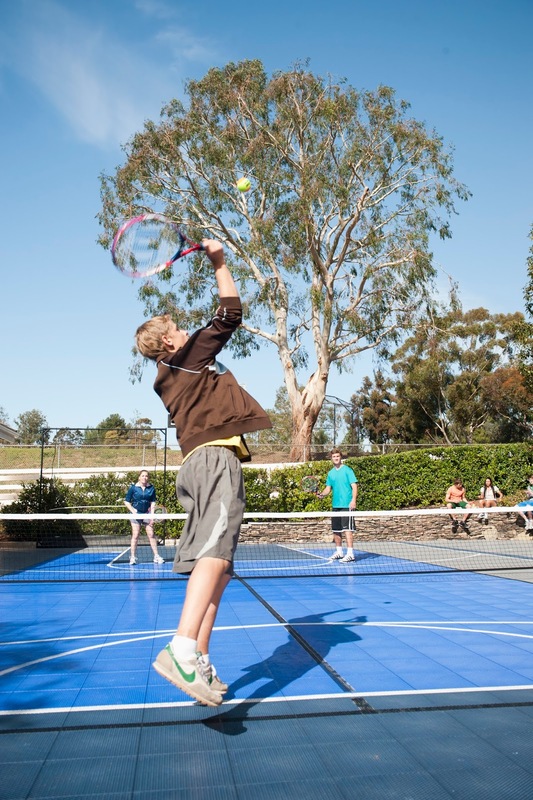 Sport Court tennis courts are USTA approved, being the safest courts in the world with the highest quality materials. 4. Muscle Development: A couple rounds of backhand serves builds up muscle development. By performing forehand and backhand serves you will increase your core stability along with toning your midsection. Attain muscle growth with Sport Court Cushion/ Resilient surface option that is layered with coating that produces spin responsive play. 5. Coordination: Running back and forth on the court enhances oxygen flow improving brain development. Researchers and scientists at the University of Illinois claimed that tennis requires alertness and tactical thinking and because of this, playing tennis could possibly generate new connections in the brain. Sport Court tennis clay courts have you freely sliding into the ball with minimum stopping. With all of these health benefits, why not get to enjoy them from your own backyard?